Though the Los Angeles Rams’ brass traded away significant draft capital to bring in some highly regarded veterans (i.e. Brandin Cooks, Marcus Peters) this offseason, general manager Les Snead and his team still walked away from the 2018 NFL Draft with valuable additions on Days 2 and 3. Former TCU offensive tackle Joseph Noteboom, the Rams’ only pick on Day 2 of the draft, ranked 16th among qualifying draft-eligible offensive tackles in pass-blocking efficiency (97.9) and earned an 88.0 pass-rush grade in 2017. Where he struggles is in the run game, as Noteboom earned sub-71.9 run-block grades in all four of his years with the Horned Frogs. Los Angeles opted for the defensive side of the ball on three of their first four selections on Day 3, adding edge defenders John Franklin-Myers and Ogbonnia Okoronkwo and former Virginia linebacker Micah Kiser in Rounds 4 and 5. 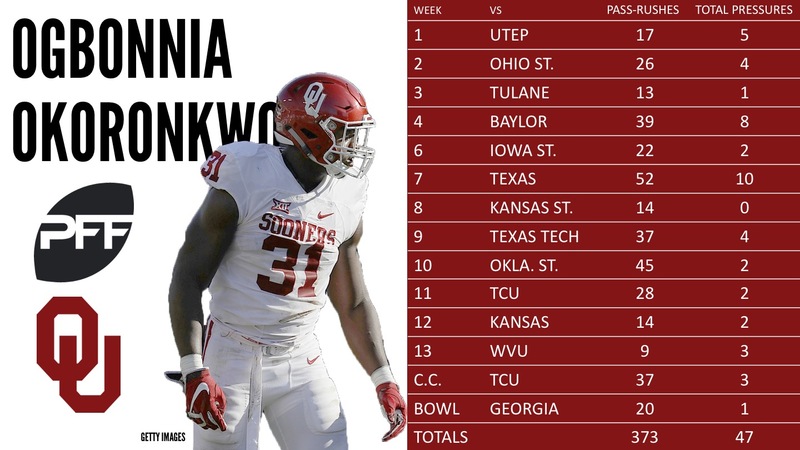 Our fourth-ranked edge in the 2018 class, Oklahoma’s Okoronkwo earned an 87.5 overall grade in 2017, racking up 47 total pressures and a career-high 46 defensive stops in the process. At 6-foot-2, 253 pounds, Okoronkwo is a skilled athlete with high-end potential in both pass-rushing and coverage roles at the next level. Kiser is a bit more one-dimensional than Okoronkwo in that he plays the run much better than he does the pass. He contrasted a career-high 83.8 run-defense grade with a career-low 43.0 coverage grade in 2017. He likely projects as a two-down run defender in Los Angeles’ defense. Of the Rams’ remaining six picks in Rounds 6 and 7, former Tennessee running back John Kelly and SMU edge Justin Lawler are two projects that could yield positive results down the road if they’re able to properly develop. Kelly improved his grades every year of his career with the Volunteers and could continue that trend if he can turn the peaks in his game into more consistent occurrences. And Lawler earned a career-high 90.7 overall grade in 2017 to cap off three years of excellent grading with the Mustangs.